Hill was the first of many prospects George Halas would snag that were virtually unknown to the rest of the NFL. He played football at tiny Florence State Teacher's College and was drafted by the Bears in the 15th round of the 1954 draft and didn't waste any time becoming a dominant force in the NFL. In his rookie season, Hill caught 45 passes for 1124 yards and 12 touchdowns. Those are numbers Bears receivers have rarely achieved during 16-game seasons through much of their history. He had a sophomore slump in which he only caught 42 balls for 789 yards but still led the league in touchdown receptions with 9. Then the following season, 1956, he returned to form, catching 47 passes for 1128 yards and 11 scores as the Bears lost the NFL championship to the New York Giants. Earlier that season, Hill made perhaps the best catch in the history of football when he laid out for an Ed Brown bomb along the goal line. 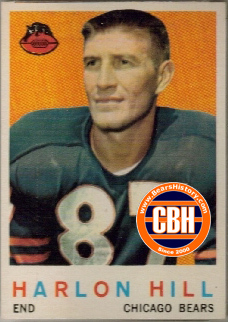 Hill would admit that after 1956 he let his success go to his head and drinking deterioriated his level of play, and his production diminished through the end of his Bears career in 1961. Hill became sober, moved back to Alabama and enjoyed a long career in secondary education. He still ranks second on the Bears' all-time receiving list with 226 catches for 4,616 yards and 40 touchdowns.